With a new Foreword by Todd Gitlin and a new Afterword by the author. While other writers contemplated the events of the 1968 Chicago riots from the safety of their hotel rooms, John Schultz was in the city streets, being threatened by police, choking on tear gas, and listening to all the rage, fear, and confusion around him. 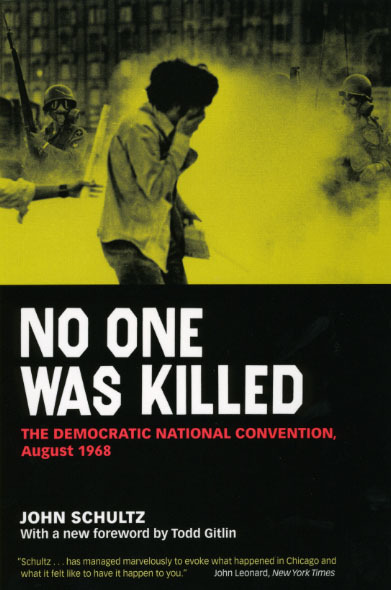 The result, No One Was Killed, is his account of the contradictions and chaos of convention week, the adrenalin, the sense of drama and history, and how the mainstream press was getting it all wrong. "[Schultzz] has managed marvelously to evoke what happened and what it felt like to have it happen to you. . . . His political thinking wades hip-high through a swamp of mysticism and comes up muddy and bloody, but in the process he refuses to slough off any of those ambiguous perceptions that amount to honesty." "A more valuable factual record of events than the city’s white paper, the Walker Report and Theodore B. White’s Making of the President combined." "Of all the book-length accounts I read of 1960’s political and cultural confrontations, none (not even Mailer’s Armies of the Night) is more lucid in its understanding of the torments and tropisms of the movements of the streets. . . . This is vivid writing that can stand as pure, suspenseful reportage."